With more and more people considering using drugs such as Chantix to stop smoking cigarettes, many people want are wondering does Chantix work, what are there side effects of Chantix and what is the Chantix success rate? Those are the questions I’ve tackled in this article but first let’s discuss exactly what Chantix is. Chantix is a prescription medication for individuals who would like to quit smoking. It is offered in conjunction with a program called GETQUIT which is supposed to increase the Chantix success rate and reduce stop smoking side effects. GETQUIT focuses on the psychological aspects of cigarette addiction while Chantix focuses on the physical addiction. It is widely understood that when a person is addicted to smoking, they aren’t only addicted physically but also psychologically. Unlike many anti-smoking aids, for instance, patches, gums and lozenges, Chantix does not contain nicotine. Chantix works by diminishing the effect nicotine has on the brain’s receptors. This helps to curb nicotine and subsequently, cigarette cravings. Instead of relying on nicotine to provide those pleasurable feelings that nicotine does, individuals obtain those same feelings from Chantix, which the drug is designed to temporarily provide. A 12 week regimen of Chantix is recommended for individuals trying to quit smoking. Concerning Chantix success rate, the results have been mixed. When it comes to most smoking cessation programs, there are a number of factors which determine whether or not an individual will be able to “kick” their smoking habit. For some people, the side effects of Chantix played a major role in them NOT being able to continue to use it long enough to quit smoking. We’ll take a look at some of the side effects of Chantix below. 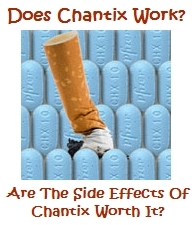 There are a number of side effects of Chantix which drag down the Chantix success rate. Some of the side effects that people report experiencing most often include nausea, depression, problems sleeping, vomiting and constipation. It is not an acceptable drug for women who are pregnant. Vomiting, nausea and sleep disturbances can make it difficult for some users to continue Chantix for the recommended 12 weeks. As a result, the use of Chantix is ineffective in helping them quit smoking. The GETQUIT support program is generally well received. It was created to work in conjunction with Chantix. It consists of a guide, which walks smokers through the quitting process, online tracking and access to a toll-free hotline. Support is available for up to one year. Chantix is a prescription medication and is thus FDA approved. This is one of the benefits of using it. It has gone through pretty stringent tests for approval. However, it is important to note that just because a drug has been FDA approved, that users are in the clear. There have been countless medications that have been approved only to be later recalled. Chantix does not contain nicotine, which means that the user is no longer ingesting the dangerous and addicting chemical into his or her body. Lastly, a decent number of people who use Chantix are able to stop smoking. The Chantix success rate is roughly 40%. Chantix has lots of negative side effects. Sometimes these effects can be so severe that individuals are unable to stick to the regimen. Chantix is also a prescription medication and may be expensive for people who have no insurance or who are under-insured. It should also be noted that many people have filed lawsuits against the makers of Chantix (pfizer) because of life altering injuries the drug has caused them. In Summary: Does Chantix Work? Chantix is yet another prescription, nicotine-free, smoking cessation drug. Does Chantix work? Well, yes and no. Concerning the Chantix success rate, fewer than half of individuals who use it quit smoking. The side effects of Chantix are also sometimes difficult to deal with. People who either don’t experience the side effects or who are able to tolerate them may find that Chantix helps them stop smoking. Again, Does Chantix work? Maybe. * Why take a chance with Chantix when there is an all natural stop smoking aid that actually works! Click Here to learn about the stop smoking aid that finally helped me quit smoking WITHOUT nasty side effects! Previous post: Miracet Reviews – Does The Miracet Stop Smoking Aid Work?